Stems: Erect, solitary, little- to much-branched, glabrous or white-mealy, grooved, often with reddish or pale green stripes; branches ascending. Leaves: Alternate, simple, mostly long-stalked, variable, rhombic to ovate-triangular or lanceolate, 1.2 to 4 inches long, .8 to 1.6 inches wide; upper surface glabrous or covered with mealy white powder; lower surface more densely white-mealy; margins irregularly toothed or wavy to entire; tips pointed; uppermost leaves linear or narrowly lanceolate, often conspicuously white-mealy. Inflorescences: Clusters, compact, dense, usually arranged in interrupted or continuous panicle-like spikes, terminal or in leaf axils, ascending at maturity, occasionally spreading. Flowers: Small, inconspicuous, about 1/10 inch across, greenish, sessile; sepals 5, lobes bluntly pointed, densely covered with white mealy powder, enclosing mature fruit; petals absent; stamens 5. Fruits: Tiny, 1-seeded, lightly roughened; seeds lens- to disk-shaped, 1/16 inch in diameter, black, shiny. Habitat: Open disturbed areas, cultivated and fallow fields, stream banks, pastures, gardens, and old homesteads; disturbed soils. Origin: Probably Eurasia. Introduced in the United States. Toxicity: May accumulate nitrates and be poisonous to livestock. Uses: Many Native American tribes used lamb's quarters as a food source. They used it raw or boiled as greens to prevent scurvy and cooked the leaves and stems with beans to reduce intestinal gas. The seeds were ground and used to make mush and bread. A tea brewed from the plant was used as a wash for sore limbs and taken for diarrhea. A poultice of the plant was applied to burns. Livestock and deer eat the young plants. Song birds and mourning doves eat the seeds. Comments: Chenopodium is from the Greek "goose" and "little foot", alluding to the leaf shape, and album is Latin for "white", in reference to the mealy coating. 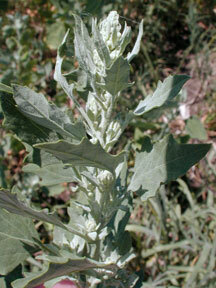 Lamb's quarters is wind pollinated and can cause allergy symptoms. It can spread aggressively. The seeds can remain viable for many years. The leaves and inflorescence often turn reddish in late maturity.